Use the Tone Sculptors to add polish, glue and analogue character. We know LANDR as an instant online mastering service, but now it's turned its hand to creating three free Tone Sculptor audio effects racks for Ableton Live. There are Low, Mid and High Sculptors, and they're designed to enhance and attenuate key frequency ranges in your mixes. Use them to add polish, glue and analogue character. If you want to delve a bit deeper, you can make use of the intriguingly named Pixie dust, Ouchie, Big, Nose and Old Skool controls. 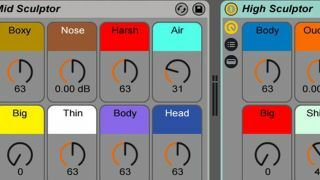 You can download the LANDR Tone Sculptors for free from the Ableton website.